The Master Lock Company offers a range of color dials in addition to the standard black combination dial. These color dials are available on various models from the 1500 Series of standard dial combination padlocks. Most recognizable from the 1500 Series of padlocks are model numbers 1525 and 1502. While most people are familiar with the standard Black dial, these locks are also available in Blue, Gold, Green, Gray, Orange, Purple and Red (product color codes BLU, GLD, GRN, ORJ, PRP and RED as pictured). The Master Lock No. 1585 and No. 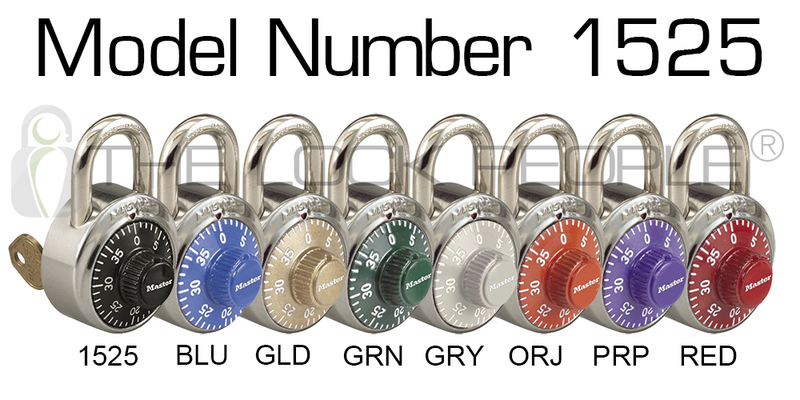 1572 Letter Lock™ padlocks also feature the same range of color choices. These four portable padlock models are only available to Businesses and Institutions because they include combination control charts for locker lock system management. The No. 1525 and No. 1585 also include the control key option to incorporate the K1525 Control Key, sold separately. The color dials are recommended as a way to bolster school spirit at educational institutions. Color dials can also be used by businesses and organizations to help strengthen the brand, especially if the dial color is a match to your corporate colors. The aesthetic affect alone is enough to create a sense of unity among locker lock users. However, there is also the added benefit of enhanced security. If all of the locker lock dials are the same color, this makes it easy for the Lock System Administrator to identify any locks that do not belong. The next time you need to procure portable locker locks for your school or business, specifically the standard dial combination padlocks from Master Lock’s 1500 Series; the color dial option is worth exploring. The color dial padlocks can be keyed to match your existing locker lock system on the No. 1525 and No. 1583. Plus you could be the one responsible for the rise in school spirit or employee morale.